In the very last paragraph of my post on Buying a photo printer I noted that my friend Dale had been having problems with his Canon i9900, the same printer I have. I’ve printed hundreds of images on my printer and only a few have shown problems but they were so minor I let them pass. 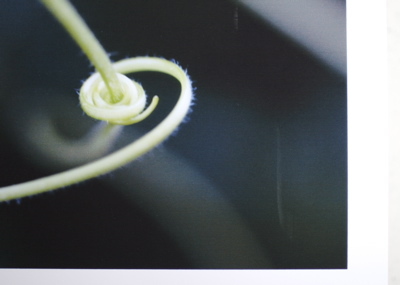 However, in printing this tendril image the problem looked considerably worse. It looked like either a smudge from too much ink or possibly some extra ink stuck to one of the feed rollers. 1. Take the paper out of the printer. 3. With the printer on, hold down the form feed button (the other button, there are only two: power and the form feed) and watch the status light. 4. When the status light has blinked three times, let go. The printer will make some noise and attempt to feed paper and it will keep doing this cycle 4-5 times. When it’s done you can put paper back in and print. I did this maintenance routine one time and reprinted the tendrils that were smudging and they turned out perfectly. I printed 4 copies and each one was perfect. I don’t think there’s any downside to doing this cleaning routine, it uses no ink like a head cleaning does so I plan to do it after any long printing session just to keep the rollers clean. I’ve avoided buying a photo printer for years. I had various early color inkjet printers and they always seemed to have problems and the results in those very early days were not worth the problems. I ended up using online services like Printroom.com and Apple’s iPhoto direct printing (done by Kodak) and have continued to use them for years. I will still use them from time to time even though I can now print at home. The online services gave me nice looking color photographs in a few days at reasonable expense without the overhead of having yet one more piece of expensive equipment in the house eating ink, clogging, and depreciating in value. 1. My friend and long-time photographer Gary Sharp bought an Epson R2400 printer and started sending me prints, not only of his photography but also of mine. The quality of the color, the variety of papers, and the fact that he could experiment with this at home all piqued my interest. 2. I met two professional photographers, Brad and Karin Smith, who live nearby and both of them were perplexed by the fact that I was so far into the photographic process yet hadn’t put much thought into printing. They consider themselves printmakers as much as photographers. To me, this was a new way to think about printing: not just as one of many end-forms of a photographic image (web, CD, print) but as a piece of “fine art.” In other words, the print would be the end product, not just one of many end products. I knew I was going to have to dig into this and part of me was excited about the possibilities and part of me dreaded my typical, agonizing process for deciding which printer to buy. As I started doing research on photo printing with inkjet printers I realized that most serious photographers use Epson printers and almost all of these same people have horror stories about clogged heads and expensive ink with their Epson printers. On the one hand, my process could be easy: just get an Epson printer. But, I do not like struggling with problems so it seemed like it was worth a bit of research first. Then I talked with Ted Roth, another local photographer who recently retired from being the head of technology at a local high school. His perspective was influenced more by serviceability than what other photographers used. He had to maintain numerous printers in a school environment so clogged heads and expensive inks were unacceptable to him. But, he is also a serious photographer who shows and sells his work. Ted got me thinking more about balancing service issues with print quality issues. As with almost everything I research and buy in the photography area, I decided to share my research task (and agony) with my friend and another long-time photographer Dale Allyn who was also interested in getting started with printing at home. He came up with lots of other ways to approach the issue and together we did much of the background research that I’m basing this article on. What Dale and I soon realized was that times have changed, and with the popularity of digital photography the big color inkjet printer manufacturers: HP, Epson, and Canon have made printing photographs at home easy, relatively inexpensive and fun. One could easily rationalize buying almost any printer on the market today, most of them produce nice looking prints and work reliably.